Recently, Windham Fabrics sent me some fabric to play with - the newly released Lucky by Lotta Jansdotter. With it, I made several projects, all from Krista Hennebury's book, Make It, Take It: 16 Cute and Clever Projects to Sew with Friends. You can see photos of each project plus read all about them over on Windham's blog today! As you can see, I made the Crafter's Retreat Apron by Krista Fleckenstein/Spotted Stones, the Double Scissor Keeper by Amy Friend/During Quiet Time, and the Little Patchwork Tote by Ayumi Mills/Pink Penguin. All were very fun to make, and definitely patterns I'd make again. The Lucky Lookbook has more ideas for working with this line, and all the Lucky prints are shown right here. Enjoy! I've been thinking about making an apron for quilting supplies lately so this is really neat to see! Love the apron, and the bag is just perfect summer! I love both the fabric and the projects you have made with it! 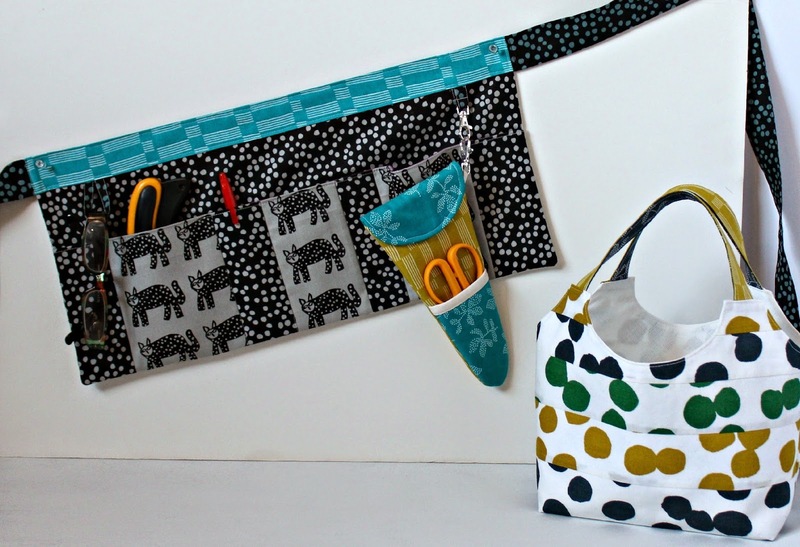 Adorable pairing of projects and fabric. Those kitties get me every time. Cute! That bag is my favorite part!